Bronwyn is the Director of Professional Education. This role includes being the Head of the Practical Legal Training program.From 2007 until 2015 Bronwyn was the Associate Dean (Teaching & Learning). 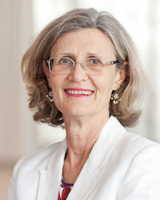 As a law academic, Bronwyn is highly regarded as an exemplary legal educator. She has extensive professional and academic experience in legal education. Bronwyn’s emerging research interests are to observe and reflect on the changing role of universities as providers of professional training; the changing expectations and circumstances of students; and the demands of the legal profession upon young graduates. Bronwyn has been responsible for implementing innovative and effective teaching and learning initiatives such as the JD program and the graduate attributes program, and developing with the Dean, Professor Jill McKeough and the inaugural Sir Gerard Brennan Professor, Paul Redmond, the Brennan Justice and Leadership Program which provides UTS law students with opportunities to strengthen their sense of social justice, and to develop the idea of service in professional contexts. Bronwyn has a strong background in legal education and took a lead role in the development of the ground-breaking UTS Practical Legal Training Program (PLT). This program was a unique innovation in legal education and has contributed significantly to the practical and career ready focus of UTS law graduates. Bronwyn has held a variety of critical administrative positions for both the faculty and the University. Bronwyn was Director of PLT Programs 1999-2001, from 2003 - 2006, Bronwyn was the University Student Ombudsman, in 2006 was the Faculty's Academic Liaison Officer, and in 2005 - 2007 the Faculty's Director (Students). In recent years, she has taught principally in the subject Ethics Law and Justice. Bronwyn joined the Faculty in 1996 from the College of Law. Prior to the College, she had been in private practice. Olliffe, B.M. 2007, Professional Conduct: Legal Accounting (2nd edition), Routledge - Cavendish, Oxon. A newly admitted lawyer needs sufficient knowledge and skill to maintain trust and office accounts in accordance with the law and good practice. With much space dedicated to practice transactions and specimen accounts, there is plenty of opportunity for readers to become familiar with the major areas of the trust account, controlled money and office records. This new edition explains important changes brought about the 2004 Legal Profession Act and the 2005 Legal Profession Regulation. Written for practitioners and students of degree or diploma courses in law and practical legal training, this text will quash all qualms about book-keeping. Olliffe, B.M. 2001, Professional Conduct: Legal Accounting, Cavendish. The beginning of the twenty-first century has seen significant changes in the legal profession, from the increased use of e-communications and incorporated legal practices, to the internationalisation of lawyers and the globalisation of practice. This raises the question are practical legal training courses providing education that still has value and relevance to students and the profession? Research based on surveying graduates of the Practical Legal Training (PLT) programme at the University of Technology, Sydney (UTS) was undertaken to assess the value and relevance of our course and to consider what changes, if any, were necessary. The findings confirmed that traditional skills of lawyering and established areas of practice continue to dominate the experience of newly admitted graduates. The findings also indicated there were skills which are not emphasised in our teaching but which were considered important by respondents. The survey also revealed some changes to graduates' career options. This article outlines our research and considers the results within the regulatory framework for the delivery of PLT. We consider that there are some changes to our programme which would improve our graduates' experience in transitioning into their first employment and we suggest that consideration be given to a review of some of the requirements for PLT providers. Our experience is instructive for other providers of practical legal education who may be considering renewal and reform of their courses. Complaints made to external agencies about Australian universities are rising in both number and complexity. Recent debate has therefore focused upon how to improve grievance handling in the Australian higher education sector. One suggested "solution" is the creation of a national Australian university ombudsman. The UK has recently introduced such a national student complaint body--the Office of the Independent Adjudicator for Higher Education (OIA), a "world first". This paper examines the structure and operation of the OIA and highlights the advantages and pitfalls of introducing an equivalent office into the Australian higher education sector. It argues that, on balance, there are advantages in a national university ombudsman. Olliffe, B.M. & Monahan, G.I. 2001, 'Competency Based Education and Training for Law Students in Australia', UTS Law Review, vol. 3. Stuhmcke, AG, Olliffe, B & Evers, M 2015, 'Resolution of Student Grievances Within Universities' in Varnham, S, Kamvounias, P & Squelch, J (eds), Higher Education and the Law, Federation Press, Leichhardt, pp. 114-124. This book is the first in Australia dedicated to the legal environment of our universities. The law both drives and governs the evolution of Australia's strong and vibrant system of higher education. Here, experts explore a wide range of areas of topical and salient interest, providing a comprehensive resource for those both within and outside the sector, including managers, governors, academics, legal practitioners and all who have an interest in the impact of the law on its operations. While their primary function today remains the provision of higher education and research, Australia's universities are now large commercial global corporations. Their operations involve the management of a diverse range of relationships, both internal and external, and the law plays a central role in these. Higher Education and the Law first considers the legal framework of the higher education sector and the relationships universities have externally, particularly with government – their governance, their funding and accountability, and their maintenance of high standards and quality. It then traverses many of the areas where the law has a significant impact on the relationships universities have with their students and their staff. In a clear and readable style, the book covers matters from anti-discrimination and equal opportunity, transparency and due process in decision-making, employment and student matters, to property rights such as copyright and ownership of intellectual property. It focuses on those issues of the most practical relevance to today's higher education environment. Varnham, S, Waite, K, Olliffe, B & Cahill, A 2016, 'Student engagement in university decision-making and governance: How does Australia compare internationally? ', Higher Education Research and Development Society of Australasia Annual conference, Fremantle, Australia. Varnham, S, Waite, KM, Olliffe, B & Cahill, A 2015, 'Building the argument for more systemic student voice in university governance and decision-making in Australia: Learnings from the UK', Converging Concepts in global Higher Education Research: Local, national and international perspectives, Society for Research into Higher Education Annual Research Conference, Newport, Wales, United Kingdom. Varnham, S, Stuhmcke, AG, Olliffe, BM, Kamvounias, P & Evers, M 2013, 'Different Country, different hemisphere - same challenges: the student and the Australian University', Annual Conference of ENOHE/OIAHE, St Catherine's College, Oxford, UK.